I don't know about you, but I love pretty designs and love seeing them on stationary like note books, pens or pretty product packaging! Unfortunately, I don't have the creative flair to come up with elegant designs and am glad for uncle Google for inspirations when I need do any graphic or design work. There are no such problems for designer and Melbournian entrepreneur Cristina Re who has successfully set up her own design house helping others create their own beautiful stationary designs (think wedding invitations and scrap booking albums), as well as collaborating with many brands to create products that adds that a feminine and elegant flair to stationery, home decor, bath & body items and even food collection via her high tea service. For those of you who haven't heard of her or seen her works, you must check her out here, where you can familiarise with her philosphy and even purchase her products online. Cristina partnered up with Target earlier this year to produce a range of home, bath and body range and I had an opportunity to check the items out first hand. Let me tell you I was not disappointed. These items sit well in any home environment and add a touch of chicness, especially the scented candle and home fragrance diffuser. I also had the the pleasure of asking Cristina a few questions via correspondence to see if I pick her brains and channel some of her creative inspiration into myself (sadly, it was not successful) but she has further reinforced the notion to pursue's one's dreams and the key of perseverance to success. So without further ado, here's what Ms Re had to say on her journey to building a successful, beauty and collaboration with Target. Where do you get inspirations from for your designs and patterns? I draw my inspiration from my travels around the world, in particular Rome (I was born in Rome and lived and studied in Italy for a number of years), Paris and Asia. I am inspired by nature, by the flora and fauna of Australia and many other beautiful countries. I am influenced by art & design from the past, and am also a big fan of beautiful interior design and draw inspiration from old vintage fabrics and wallpaper. You could say I also love fashion and beautiful packaging, and follow trends from around the world to help me create my new ranges. What has been your favourite project/body of works to date and why? I get very excited about the Bath and Body ranges I have produced. Creating these collections is very exciting for me, as I have always had an obsession for beautiful fragrances and packaging. For as long as I can remember, I have indulged in purchasing exquisite soaps, candles and perfumes from around the world and have found myself keeping each piece as a collectable decorative object used predominantly to adorn my home - so now I'm proud to have created my own products with my own favourite scents adorned in elegant packaging. What does a typical day of yours entail? A typical day is very busy! I am a very hands-on worker and like to oversee every creative element of the business. I am passionate about design and believe it is important to inspire and motivate my team to ensure that they understand and believe in the vision. Having said this, my days consist of overseeing the creative process of creating new designs and products, marketing my company and brand, whilst also managing the rest of the business from a higher level as well. I attribute a lot of my success to the people I have surrounded myself with. Having a good team of people to support you is critical. I have always had many like-minded friends in the industry that have pushed and inspired me and I have had great support from my family. In order to create a good team I believe that communication is the key to achieving success. I also believe in treating my staff the way I like to be treated myself and having a philosophy of work life balance is key. I aim to provide a beautiful and highly creative environment that inspires and breeds success. There have also been many amazing businesswomen in the international arena that I have been inspired by, often in completely different fields of work, namely writers, television personalities and fashion designers. How did the target collaboration come about and where was its inpirations? Target approached me to design the Peacock Garden range as they were looking to associate themselves with other recognized Australian designers that have a wide fan base and following. 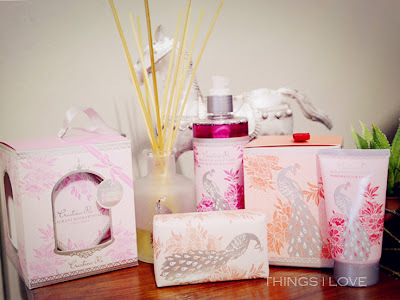 With the Peacock Garden range Target wanted me to design something stylist and feminine for this year's Mothers Day which was also the ultimate affordable indulgence. My inspiration behind the Peacock Garden range for Target was to create something centered on my love of gardens that also contained pretty florals and my favorite animal motif, the beautiful and iconic peacock, which I incorporate in many of my paper designs. My inspiration behind the 3 fragrances in 3 pretty colour choices was my favorite personal blend of flora and fruits, containing hints of rose, jasmine, summer flowers and fruity fragrances. What one beauty product can you not live without? I would have to say body lotion. My favorite product from the collection would have to be both the body wash and hand lotion, because the beautiful scents linger all day and leave a lasting impression. They have a stimulating and sensual fragrance, reminding me of summer flowers and fruit. They also contain no parabans, SLE’s or PEGS which are gentle for the skin and are not tested on animals. What upcoming project/works can expect to see in the near future from you? I am a big dreamer and visionary, an overachiever and love challenges, so I see the development of many diverse and unique lifestyle product ranges to expand the Cristina Re offering. I love telling a story in every collection that I release, so I look forward to creating new and unique ranges that set the trends and continue to inspire people. I plan to extend the High Tea collection to offer further new colours and patterns that are feminine and beautiful. The new releases will be perfect to mix and match and become collector’s items to invest in and cherish for years to come. 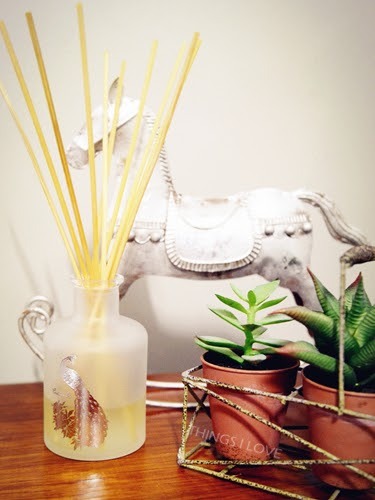 My long term goals are to further expand my line of giftware products by continuing to offer innovative and beautiful collections that tell a unique story, providing the ultimate sensory and celebratory experience. I hope to continue to inspire others through my artistic work, and perhaps through writing self-help motivational books and films. Thank you Cristina for taking the time out in your busy schedule to answer these questions. You can pick up Cristina's affordable Target products in three delectable scents: Amber Rose, Mandarin Passionfruit or Pomergrante Lychee in stores or online.